In October 1914, the 1st Marine Regiment was sent to Belgium to lift the siege of Antwerp and repel the German advance. From 24 October to 10 November, the Marines held the position of Dixmude. At the cost of heavy sacrifices, they drove back a fierce enemy and saved Dunkirk. 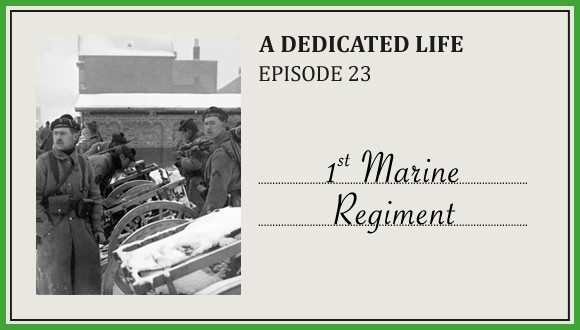 In 1916, the Marines were grouped together into a battalion that fought in Belgium until spring 1918. In September, the battalion suffered heavy losses while fighting at the Moulin de Laffaux. In July 1940 in London, the officers and students at the Marines School in Lorient rallied around Free France and helped to set up the 1st Marine Battalion or BFM (Bataillon de fusiliers marins). The 1st BFM took part in the attack on Dakar then several operations in French Equatorial Africa. In Libya, it became an anti-aircraft defence unit which distinguished itself at Bir-Hakeim and then in Tunisia. After becoming the 1st Marine Regiment in September 1943, it was integrated into the 1st Free French Division, and distinguished itself in combat in Italy and France in 1944 and 1945.